Emma Green Design, a London residential interior design company, has been unveiled as a pro bono partner for the upcoming Voice of Youth, 10,000 Campaign being held at the exclusive Saatchi Gallery on the 24th April 2018. 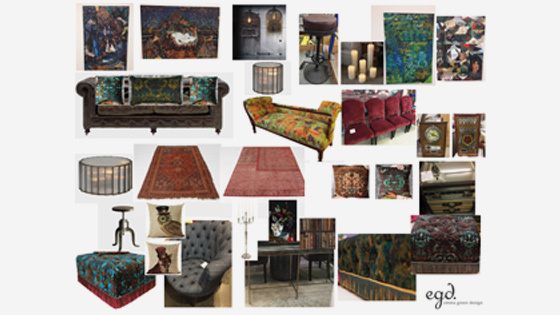 Emma has been tasked with designing one entire gallery at the Saatchi to create a steampunk inspired chill out room. The steampunk theme was chosen by the Global Fund for Children due to its connectivity to London during the Victorian times, when all eyes were on the rapid developments of science, industry and technology, that evoked both wonder and fear and that whilst this was going on children were still being used as human chimney sweeps, and what has really changed today? Emma has collaborated with various companies to interpret the brief and bring this theme to life and her design will include a specially designed steampunk unicorn head, sumptuous velvet fringed seating, a union jack chesterfield sofa, a bicycle wheel musician’s stool and skull floral display. Nicky Wynne, Managing Director,” Global Fund for Children is a small, cost effective and dynamic charity with a large global reach. Each year we work with over 170 non-government organisations, partnering to build a world where all children and youth are safe, strong and valued. Pro-bono partnerships are the cornerstone of our work. Emma Green is a London based interior designer specialising in providing the highest quality residential interior design and decoration. Emma takes pride in creating stylish, elegant and comfortable spaces, that reflect and enhance clients' lifestyles and individuality, whilst maintaining a commitment to quality and goal attention to detail and budget.